PolyCE Consumer Survey: Your feedback is much appreciated! The aim of this survey is to better understand European consumers’ attitudes towards the Circular Economy and post-consumer recycled plastics in the electrical/electronic industry. 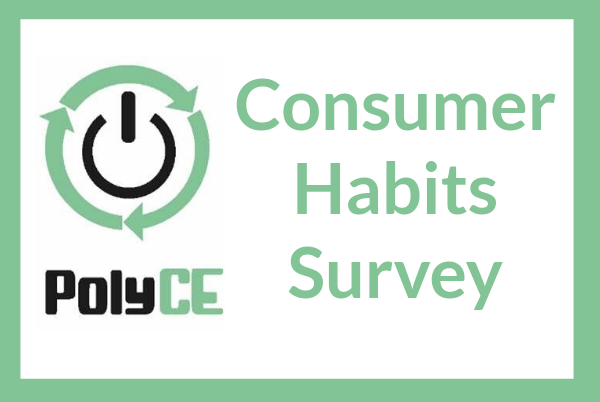 The survey will serve as a basis for PolyCE project’s consumer campaigns aiming to encourage circular consumption behaviors and to raise awareness of the economic and environmental benefits of recycled plastics in electronics. Responses are to be anonymised and to be used only for the research-purposes of the project, in line with privacy considerations outlined in the EU Data Protection Regulation.